I’ve come to love the change of seasons. That wasn’t always the case. When you grow up in Southern California, it goes something like this: spring, summer, summer, summer. No school because it RAINED too much (true story). Trick-or-Treating without a jacket. Christmas lights on our little palm tree. You get the idea. Occasionally, there will be a very cold snap- I remember snow on that palm tree. But I didn’t understand the four seasons until I moved to the mountains in Colorado. I hated it at first. Snow was not my friend. Not when driving, not when picking out an outfit, not when daydreaming of the beach time I no longer had access to. Now, I can’t imagine Christmastime without white stuff on the ground. The first leaves that turn crimson or rust or golden make me gasp and feel nostalgic. There’s that first morning warm enough to roll the window down while driving, or the first time I slide my feet into flip-flops for the season that means summer is near. And there’s nothing like spotting the first signs of spring after a long, cold winter: the buds on the trees, the grass beginning to green, and the flowers starting to bloom. In Utah, the first flowers to make an appearance are the crocus: little white, yellow, or bluish-purple blossoms that stay low to the ground where it’s warm. Forsythia is another favorite of spring- a shrub with vibrant yellow flowers that cover each branch in an explosion of brightness. Daffodils come next, followed by tulips, and then day lilies, iris, and the roses of summer. Color, color… everywhere! If you’ve followed my blog since the beginning (way back in April), you know that by that time of year, I’m done with winter. Springtime can’t come soon enough. This year, we had a snowstorm in April. This shouldn’t surprise me. I’ve lived here for almost 12 years, and sometimes it snows in May. Or June. People ski on the 4th of July! But each time, it feels a tad catastrophic to me. I aspire to be like a daffodil. By April, the daffodils are out, those happy, golden faces tilted toward the sunshine. They prompt smiles, just by being alive. They get snowed on every single year, and I’m always amazed that they survive. How inspiring! This is my entry in Booked.net’s “Capture the Season.” I was invited to select a photo of mine that expresses a season to me. One can’t capture on film the salty smell of a summertime trip to the beach, or photograph the feeling of the first chilly night that signals fall’s arrival. The strength of the daffodils in varying conditions is my signal that the rebirth of seasons is here. 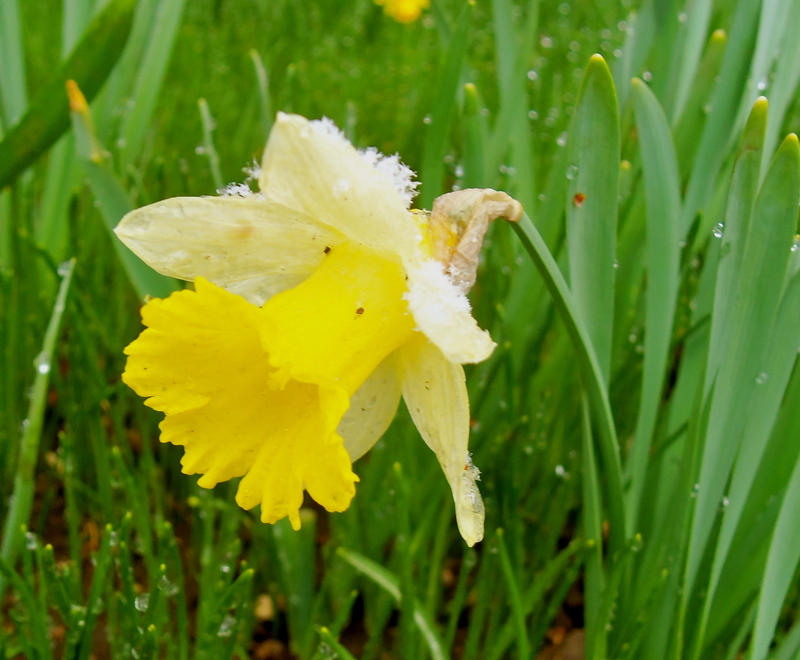 I realize it’s spring when there’s snow on the daffodils. And what a glorious and welcome sight. What are your signals of spring? Summer? Fall? Winter? Do share! Next postGrape-Nuts Peanut Butter Bars. When our daffodils and tulips start to come up, it’s spring. I just love the changing of seasons! I couldn’t agree more, Amber. Each one brings something to look forward to! What a lovely symbol for change and renewal 🙂 I just LOVE fall and winter, but I’m a northern lass born and bred! The turn of the seasons – every single one! – are the most exciting parts of the year for me, too. Happy fall!